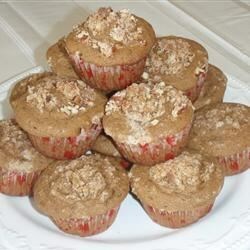 "These sweet and nutty muffins are perfect with a cup of cafe au lait." Preheat oven to 375 degrees F (190 degrees C). Lightly grease 10 muffin cups. In a large mixing bowl, combine flour, 1/3 cup brown sugar, baking powder, salt and 1/2 cup chopped pecans. Add melted butter, milk, instant coffee, vanilla and egg. Mix until all of the dry ingredients are absorbed. Fill the prepared muffin cups 2/3 full. Combine the remaining brown sugar and pecans, sprinkle over the tops of the muffins. Bake at 375 degrees F (190 degrees C) for 18 to 20 minutes, or until a toothpick inserted into the center of a muffin comes out clean. A great breakfast or lunch recipe for leftover quinoa. Loved them! Wonderful, rich, deep coffee flavor. A bit crumbly, I'm going to try for a bit moister next time. WILL be making these again! Easy, great tasting, great smelling muffins! Try not to eat the whole batch yourself!